Earlier this year we did a special series of blog posts in support of Banned Books Week. From now until December 2 you have a unique opportunity not only to support the freedom to read, but also to score some great holiday gifts in the form of original artwork by children’s book illustrators! The American Booksellers Foundation for Free Expression is holding a holiday auction. Children’s book illustrators who have contributed original artwork include Eric Carle, Judy Schachner (of Skippyjon Jones fame), Tom Angleberger (creator of Origami Yoda), and Ohio’s own Adam Rex. 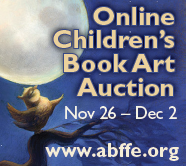 You can head on over to the auction by clicking the image above, and you can learn more about the ABFFE by clicking here. Today we have a guest post by Ohioana’s executive director, David Weaver, who served as development director for nearly eight years before assuming his new position in September. On the anniversary of John F. Kennedy’s assassination, David reflects on his memories of that day and on the Ohio connection to one of Kennedy’s trusted advisors and friends. “Today marks the 50th anniversary of the assassination of President John F. Kennedy – an event that no one who was alive and old enough to remember will ever forget. I myself was a sixth-grade student at East Linden Elementary School. I can still vividly remember my teacher, Mrs. Rogers, ashen faced as she told us, “I don’t know quite how to tell you this, but the president has been shot.” Soon we learned that the man everyone knew as JFK was dead. Like all Americans, my family spent the next three days transfixed before the television. 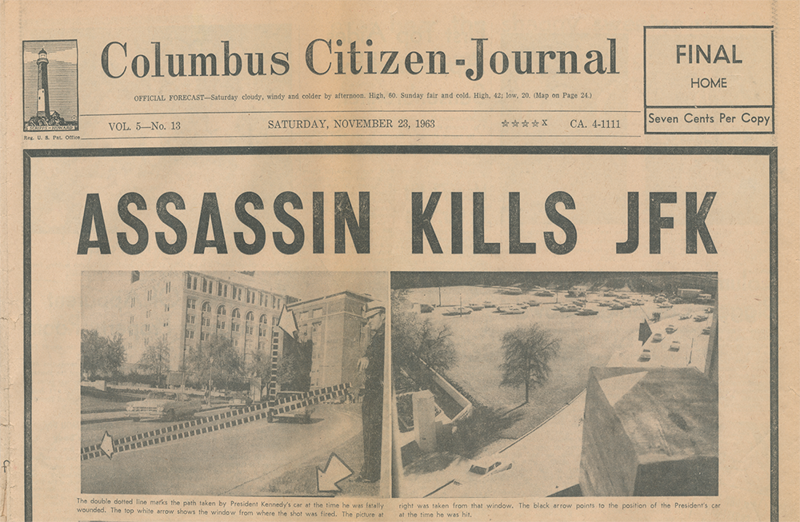 I read the special edition of the November 23, 1963 issue of the Columbus Citizen-Journal and put it away as a keepsake that I have to this day. You may not know this but there was a close Ohio and Ohioana connection within the Kennedy White House. Columbus-born Arthur Schlesinger, Jr., was a noted teacher and historian who had won the Pulitzer Prize and two Ohioana Book Awards by the time he joined the Kennedy administration in 1961. Schlesinger had been a friend of Kennedy’s since they had been classmates at Harvard. He served Kennedy in a number of capacities: speechwriter, historical consultant, adviser. But mainly he was there to document the administration in preparation for the memoir Kennedy planned to write once he left the White House. The assassination, however, changed those plans irrevocably. 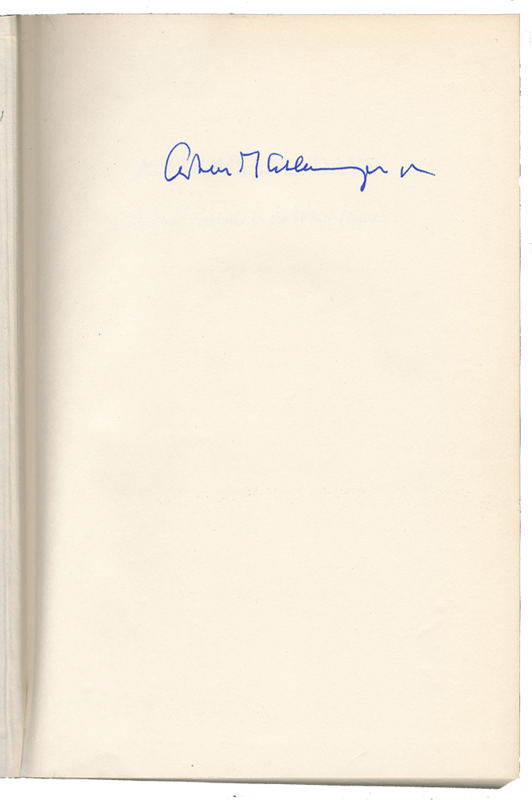 Schlesinger decided to take the notes he had compiled during the thirty-four months of JFK’s presidency and wrote A Thousand Days. (The title was taken from one of the passages in JFK’s memorable inaugural address). The book, the first by a member of Kennedy’s inner circle, was released in 1965 and won both a Pulitzer Prize and a National Book Award. Schlesinger would continue teaching and writing for four more decades. He famously coined the term “imperial presidency” in the title of his book about the Nixon administration and its abuses of power. In 1979, Schlesinger won a second National Book Award for Robert Kennedy and His Times. One hundred and fifty years ago today, Abraham Lincoln delivered one of the most famous speeches in U.S. history. In honor of this we’re highlighting a new book in Ohioana’s collection: Writing the Gettysburg Address by Martin P. Johnson. Johnson, an assistant professor of history at Miami University, conducted extensive research using numerous primary sources and contemporary accounts of the speech. 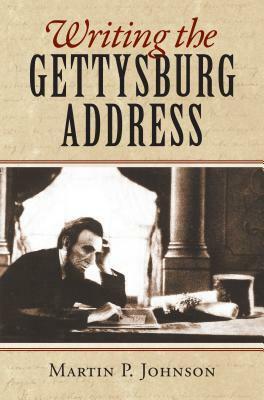 His book traces the creation of the Gettysburg Address from the first draft through revisions the morning of the ceremony and Lincoln’s delivery of the address itself. Along the way Johnson sheds light on many of the myths surrounding the speech, and also shows how the speech’s evolution mirrors Lincoln’s intellectual and emotional journey from Washington to the battlefield. For more information, including images of two handwritten drafts of the Gettysburg Address and a photograph of Lincoln on the podium, you can visit the Library of Congress “Gettysburg Address” online exhibit here. 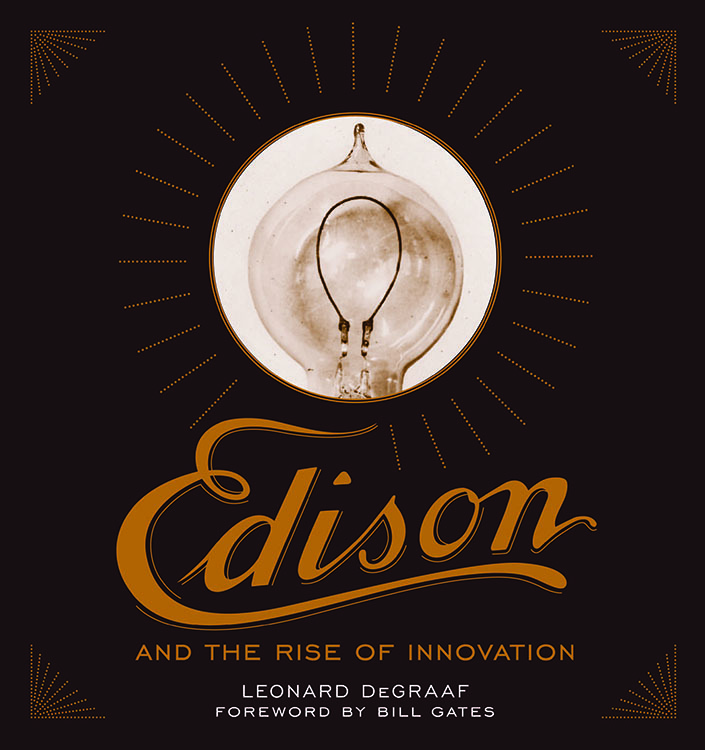 Today we’re highlighting a recent addition to Ohioana’s collection: Edison and the Rise of Innovation by Leonard DeGraaf. The author is an archivist at the Thomas Edison National Historic Park, and it shows; almost every spread contains images such as family photographs, Edison’s homes and laboratories, advertising ephemera, correspondence, and pages from Edison’s notebooks. Edison was born in Milan, Ohio, and also worked for a while as a telegraph operator in Cincinnati. The book covers his life in detail, including major accomplishments such as electric lighting and the phonograph as well as lesser-known inventions such as a talking doll and an electric pen. Throughout, DeGraaf focuses not just on the moment of discovery, but also on the process Edison used to design, manufacture, and market the products developed in his labs. Ohioana is currently looking for book reviewers! If you’d like to review this book or another one in our collection, you can visit this page of our website for more information. You can also visit our “to read” shelf on Goodreads to see what’s available. Finally, we’re sharing an Edison item from Ohioana’s own archives. 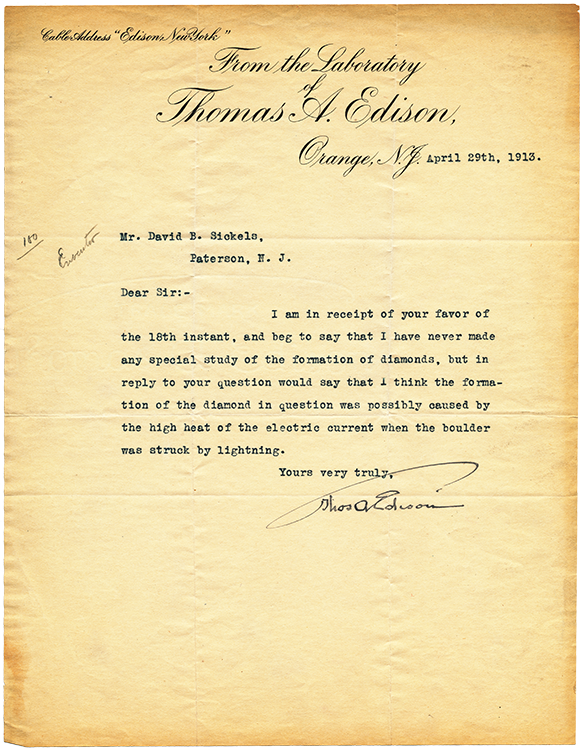 This 1913 letter was signed by Edison and sent from his lab in West Orange, New Jersey. 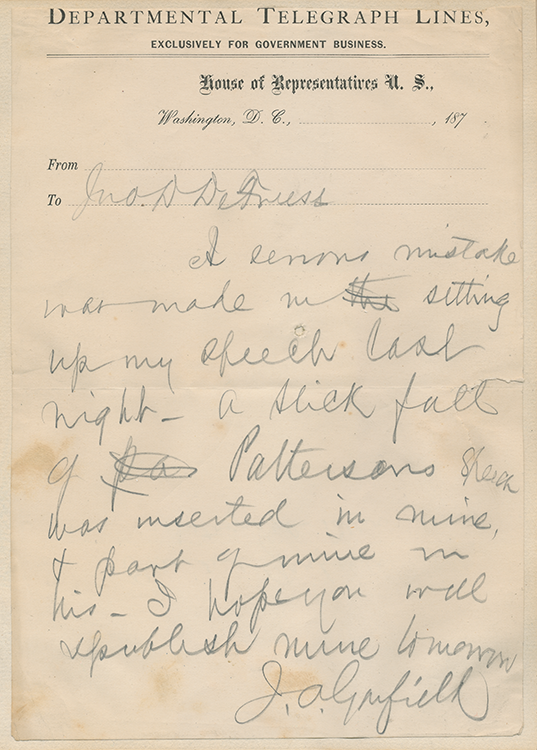 It is part of the library’s collection of correspondence signed by prominent Ohioans. In the spirit of election week, we’re featuring a few items from our Ohio Presidents collection. We’ve featured some ephemera from this collection in a previous post; today we’re sharing some pre-presidential correspondence. This letter signed by Ulysses S. Grant was written in July 1865 to John Aaron Rawlins, Grant’s chief of staff at U.S. Army headquarters and later his first secretary of war. The two men first met in 1861, when Grant was forming a regiment in Rawlins’s hometown of Galena, Illinois to meet President Lincoln’s call for troops. Rawlins stayed with Grant throughout the war and played a significant role in maintaining Grant’s public image and encouraging his sobriety during the conflict. In the letter Grant mentions Rawlins’s return to Washington “…I hope with health materially improved.” This likely refers to the fact that Rawlins had contracted tuberculosis; he died in 1869 at age 38. Grant served two terms as president (1869-1877) and died in 1885 at age 63. This undated telegraph message from James Garfield appears to have been written sometime during his nine consecutive terms in the U.S. House of Representatives. Although Garfield’s congressional service had been long, his presidency lasted just six months before he was killed by an assassin’s bullet in 1881. This letter from Benjamin Harrison was written when he worked as an attorney in Indianapolis. 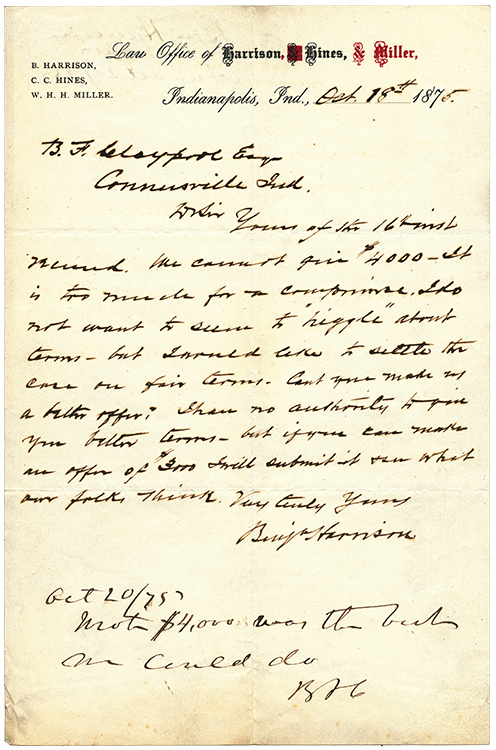 In the letter Harrison attempts to negotiate a more favorable legal settlement for a client; however, an addendum at the bottom states that the original offer was the best the other party could do. In addition to his law practice, Harrison was active in both state and national politics: he served as reporter for the Supreme Court of Indiana, was a delegate to the 1880 Republican National Convention, campaigned for presidential nominee James Garfield, and was elected to the U.S. Senate. Harrison served as president from 1889-1893, and died in Indianapolis in 1901 at age 67.